Did the Steam Engine or Spinning Mule lead to the Industrial Revolution? February 10, 2014 February 10, 2014 2 Comments on Did the Steam Engine or Spinning Mule lead to the Industrial Revolution? From Wikipedia “The introduction of the Spinning Mule into cotton production processes helped to drastically increase industry consumption of cotton. 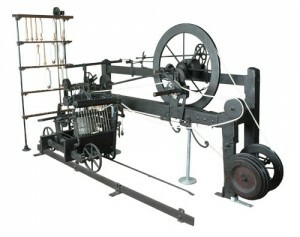 This example is the only one in existence made by the inventor Samuel Crompton. It can be found in the collection of Bolton Museum and Archive Service.” Image by Pezzab. Bragg: … Oh it’s all to do with the broad sweep of history. Listen people invented things that hadn’t been there before which enabled things to happen that had not happened before. Bragg: I didn’t say that! Bragg: OH NO! COME ON—THAT’S RUBBISH!! The episode continues for another half an hour and covers some of the major interpretations of the Industrial Revolution in the process, though the animosity between Hudson and Bragg remains. Another guest, Prof. Jeremy Black. from the University of Exeter, generally sides with Bragg and provides some more nuanced arguments defending the perspective that British culture contributed to the industrial revolution. I think this episode is great for teaching, as it brings historigraphical debate to the forefront and makes it clear that even an event like the Industrial Revolution remains deeply contentious after two hundred odd years of historical analysis. The episode does not, however, resolve the question: “Did James Watt’s improved steam engine or Samuel Crompton’s spinning mule (along with a number of other key inventions) lead to the industrial revolution?” It leaves us with as many questions as answers. This is a real and significant historical question and historians have gone even further, questioning whether the Industrial Revolution happened at all. This is because Watt and Crompton’s inventions did not lead to explosive or ‘revolutionary’ economic growth in the later eighteenth century. At the same time, questioning the existence of the Industrial Revolution seems absurd. The world we live in, fuelled largely by coal, oil and gas, is dramatically different from the world where humanity largely relied on the energy capture from the sun (grains, grasses, timber, and fibers grown or harvested from forest along with water and wind power). This biological old regime placed real limitation on economic development and population growth. In fact, a number of regions of the world had populations and economies that were pushing up against the limits and found themselves in a situation where any increase in cotton or steel production (which required cotton fields or charcoal), would encroach on land that was already in use for growing rice, wheat or potatoes. China and Denmark were pushing up against their natural limits by the end of the eighteenth century. Britain was facing a similar situation, but instead of economic stagnation, they transitioned to an economy fuelled by hydrocarbons. The new revisionist argument put forward by Kenneth Pomeranz and Pat Hudson suggests that the British were lucky. They had coal that was relatively easy to mine and close enough to urban centres to make early mines profitable. The first key invention, the steam engine, was very inefficient and only viable in a location where coal was effectively free. They were used at coal mines, where they were employed to pump water out of the ground to allow miners to dig deeper into the coal seam. It is hard to imagine this invention catching on in a region that relied on burning a limited supply of wood for heat. E. A. Wrigley, a historical demographer at Cambridge, recently suggested we’ve been asking the wrong question about the Industrial Revolution all along. Instead of asking why industrial development started, we should instead ask why it did not stop. There are numerous examples of technologically advanced societies pushing up against the limits of the biological limitations of their environment. What is remarkable in the British example is that economic and technological growth continued over the long term after coal freed their economy from the biological limitations. A steam engine powered cotton factory would be of limited use in a region without coal, as the cost in land would be too high. So does the time and place of the Industrial Revolution really just boil down to geography? Margaret C. Jacob think this economic/environmental perspective is far too reductionist and does not focus nearly enough attention on human agency . After all, as Bragg argued, James Watt, Samuel Crompton and others “invented things that hadn’t been there before which enabled things to happen that had not happened before.” I expect the debate will continue. Kenneth Pomeranz, The Great Divergence: China, Europe, and the Making of the Modern World Economy, (Princeton University Press, 2000). E. A. Wrigley, Energy and the English Industrial Revolution, (Cambridge: Cambridge University Press 2010). Margaret C. Jacob, review of “E. A. Wrigley. Energy and the English Industrial Revolution. Cambridge: Cambridge University Press, 2010″, H-Net Reviews, http://www.h-net.org/reviews/showrev.php?id=31708.